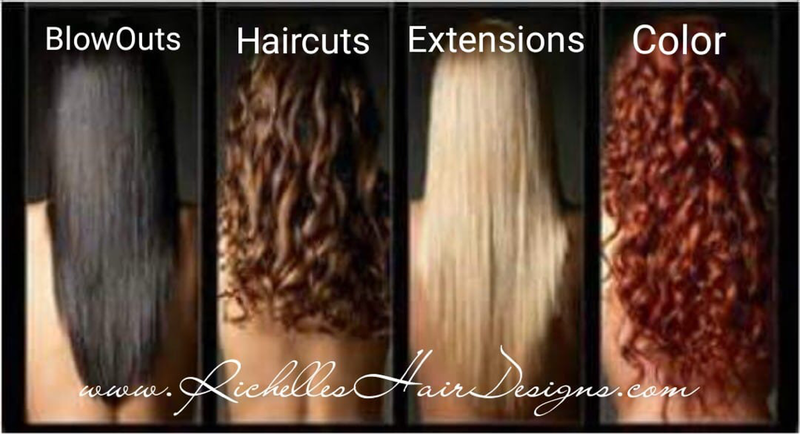 ​Richelle's Hair Design's main focus is to provide great customer service, and quality healthy hair care services to clients of all hair types. Richelle wants everyone that steps into her salon to feel as though they "Walked in as guest, but Leave as Friends". She is known as the "Hair Whisperer " for hair, for her ability to turni the "impossible" into the "possible". Her specialty is growing and maintaining healthy hair, whether it’s Chemically processed with color or relaxers, in extensions, or in its natural texture. Richelle has been doing and wearing natural hairstyle years before it became "popular". Clients love her " very real" personality and her honesty about what will or will not work. As she always tells her clients "that is my name going out the door on your head". She does not sell product brands, but results. Healthy Hair Care is a serious business to Richelle’s Hair Designs. Schedule a consultation to get to know Richelle and how you too can start your healthy hair journey . Services vary from thermal straightening, Keratin (smoothing or Taming ) treatments, blow outs, natural hairstyles, highlights, hair extensions (tape,braid-less, micro links, Microlinks extensions, beaded weft, sew ins, weaves, NBR, klix, natural beaded row, strand by strand, keratin fusion bond, etc), installing, cutting and styling wigs, hair loss issues, hair color, perms/permanent waves, haircuts, relaxers, hair treatments, Bridal and Special Occasion up dos, and much more. Questions and Concerns are always welcomed. Long waits or double booking are not allowed because every client's time is valuable. Customer Loyalty and Referral promotions are available once you become a client. ​Pre-booked appointments that are scheduled immediately after every visit, before leaving the salon, are reward with a percentage off the total bill . Walk ins are accepted but will only be taken if time permits. Scheduled appointments are always receive priority. All appointments should receive a confirmation either via text, email or both. 24 hours notice is required for cancellations and reschedules. If less than 24 hours 50% of that appointment will be added to your next bill. Repeated cancellations and reschedules even if within the 24 hours will result in needing a non refundable deposit for every appointment in order to schedule in the future. There is a $15 late fee for appointments after 15 minutes late ....after 30 minutes clients must reschedule and will be charged 50% of the bill for that day. and will be applied to the total cost of the bill at the time of service. No appointment is guaranteed until deposit is paid. If a client cancels, reschedules or no-shows all deposits are forfeited . This protects the stylist as well as the client to ensure that everything runs smoothly with scheduling. Consultations are highly recommended but are required for color and extensions services. Without a consultation nothing is guaranteed. Accurate pricing and proper color evaluation can not be determined without a consultation. Consultations fees start at $30 for 30 minutes and must be paid prior to scheduling. Consultations fees are nonrefundable and may be applied to a future appointment that must be made at the time of the consultation.